From time to time I’ll call my mom on Saturday afternoon where she’ll predictably ask, “What’s going on?” I’ll try to sound as frazzled as possible as I tell her, “Well, I just got out of jail.” It gets a rise out of her every time. The sad thing is that, considering my past, I think the first place her mind goes is that I was in there for some crime and not because I am a priest fulfilling one of the corporal works of mercy. Last week as I was hearing confessions before Mass in the jail, I was reflecting that those four walls could have been my fate- that the only difference between the inmates and me is they got caught. In ancient times, one could serve their sentence with time or money. Often, their ransom was paid by a family member or friend. Under the eyes of God, we are all condemned sinners who have been freed by Jesus paying the price for us. Last week, I was struck by one inmate who stayed after Mass to chat a bit. On the outside he was a medical doctor. I didn’t ask what he did to end up there, that’s not good jail etiquette. 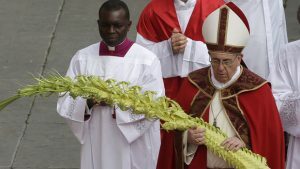 But he did share how much he misses going to daily Mass. He also shared how we was meditating on the Gospel passage of the Lord’s Passion every day to prepare his heart and mind during Lent. What struck him is how the Gospel is being relieved right there in jail. As he would make the long walk down the hall to go to Mass other inmates would mock him. While others would exchange blasphemous banter and animalistic insults. This doctor couldn’t help think of the belligerent Roman soldiers mocking Jesus. While others were simply incredulous and closed off to the Good News. When invited to Mass or a Bible Study they get mad and defiant- just like the Jewish leadership. There is also the great crowd of those who are indifferent. Those who are too concerned with creature comforts to care about the Creator. Then this doctor reflected on the role of the good thief; who recognized his crime, the justice of his punishment- but more importantly recognized who Jesus is, ask for forgiveness and enjoyed the promise of paradise- even in the midst of his own crucifixion. I was really blown away by the depth of faith of this modern day good thief. For indeed, we are called to realize that the events of Jesus are not relegated to the history books- but are being relieved every day in our world. Granted, Jesus died once and for all to save us. He really did rise from the dead and is seated at the right hand of the Father. This is historical and true. It is also true that He is searching for us to incorporate that mystery in our own lives- by fully participating in the sacraments- the mystery of Jesus’ life intertwines with our own. Our baptism is a participation in His Death and Resurrection. Mass makes the entire Paschal Mystery present upon our altar in within our hearts. We are forgiven in the confessional just like the woman caught in adultery. Like that inmate, we would do well to reflect during this holiest of weeks on Our Lord’s Passion and Death. What character we are in this Divine drama? 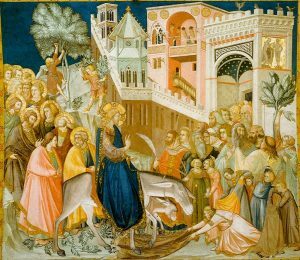 In reflecting on how we can make the mystery of Palm Sunday present in our lives, many of the early saints said we need to play the part of the donkey. Donkeys are known for being tough. They will basically go wherever you lead them; with the right master, they can be very docile and teachable. They aren’t much to look at but rather deflect the attention to whomever is riding upon them. They are a vehicle. Matthew mentions that this particular donkey never had anyone ride it. For his Jewish audience, that meant that this donkey was dedicated for a godly purpose. We are supposed to carry Christ. We are called to be consecrated to God and used for a godly purpose. We are to be humble workers in the Lord’s field. May we realize that while Jesus is the savior of the whole world, He is our personal savior- that you and I were on His heart and mind as He was upon the Cross- that He has ransomed us from sin and gives us hope after death.